*There are no rips or tears. *The material isn't stained or faded. *All items are sold as is. All warranties are VOID. The month of May for most cycling fans signifies one thing, the start of the grand tour season, kicking everything off with our favorite of the three, the Giro. 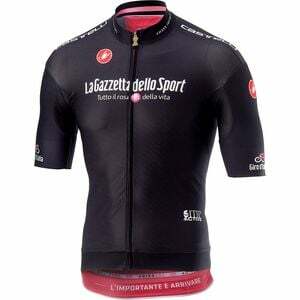 Castelli is the 2018 official race jersey sponsor and it's giving you the chance to own and don the identical jerseys worn by the four classification leaders including a tribute to the short-lived Maglia Nera jersey. That's right, the Men's Giro Race Full-Zip Jersey will have you inspired to ride a little longer, push a little harder on the climbs, and grab an extra gear in the sprints. Built with the same dedication to a race-ready fit, quality materials, and extraordinary craftsmanship as all of the other Castelli jerseys, these leader jerseys are as light and breathable as they are aerodynamic, with some unique touches making them extra special. A few of our favorite details include the zipper pull that is a tribute to the gold Trofeo awarded to the overall winner, the Infinito Internal neck finishing with Giro infinity silk-touch ribbon, and the raised 3-D print Giro on the sleeves and the Trofeo on the back of the neck. The jerseys are sold in 6 sizes from Small through 3X-Large and in the colors Rosa (overall leader), Ciclamino (sprint points leader), Bianco (best rider under 23), Azzurro (king of the mountains), and the aforementioned Nera (a hotly contested jersey presented to the last place rider that was only awarded between 1946-51).